In January of 2018 we took the Off-Leash Play Pet Center Safety Pledge! We proudly commit that our dog daycare program has been designed for the safety of all dogs. In taking the pledge we strive to ensure the physical safety of each dog and our goal is for every dog to go home from our center behaviorally and emotionally better than when they arrived. We are proud of our focus on safety in our dog daycare program and felt the pledge was the perfect way to share that commitment with you. There are ten aspects listed in the pledge to operating as a safe and fun off leash play program! We are committed to continually strive to meet and exceed each one. Created by The Dog Gurus [www.thedoggurus.com], you can take the Off-Leash Pet Owner Safety Pledge and learn how to keep your dog safe during play. 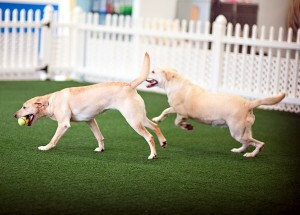 At Savy Paws Pet Resort we understand dogs and their need to exercise. Play helps keep a dog’s body and mind active and builds a healthier, happier, and better-behaved pet. That is why our Doggie Day Care is always rich with activities and attention in a clean, healthy, fun, and nurturing environment. Savy Paws Pet Resort provides a safe place for pets to be cared for in an environment that allows them to interact with other dogs. This can curb destructive behaviors and help alleviate separation anxiety. It’s also stimulating for dogs whose owners are away during the day or for dogs that need extra activity and social interaction. Play time is fully supervised at all times to ensure a safe play group every day. Two large play yards and one extra large outdoor play yard divide the play groups according to size, age, play style, and temperament. The play yards are constructed using K9 Grass which allows the dogs to run safely on unlike concrete or coated floors which can become slippery. K9 grass with its unique features helps promote a cleaner, safer, environment for pets to play on. Doggie Day Care isn’t for every dog. However, we can retrain and rehabilitate some dogs with poor or questionable social skills. We have successfully helped many dogs overcome their fear and insecurities. For about the same price as pet sitters or dog walkers charge for an hour or less, your dog can get all-day play and get some real exercise. It’s just like a dog park, but all day long. Now when you take your dog to doggy daycare, you’re best friend will really be able to run and play in one of our indoor dog play yards, so he/she will come home tired!